Your dream garden can be yours! Soo Spector Garden Design in Rutland offers a bespoke service to deliver the garden of your dreams. A place to sit and contemplate or immerse yourself in an ever-changing array of colours and shapes. We believe in garden design which brings outdoor harmony into your life and home, using a palette of your preferred plants to turn your imagined garden into reality. Working with you, we'll design an outdoor space that feels as comfortable as your cosiest armchair or as reassuringly familiar as your trusty kitchen table. This will be your garden and so our goal is to ensure it's a reflection of you. Each garden is designed to your requirements and budget. That means providing options from a light makeover to a full design and garden build. We cater for all garden styles from family, contemporary and cottage to traditional, formal, and naturalistic. We relish the challenge of everything from single beds and courtyards to large gardens. And when we're finished you can call on us for after care garden maintenance when required. Begin the transformation now, find out more about our garden services or contact Soo for a consultation. Make your garden the favourite room in your home! 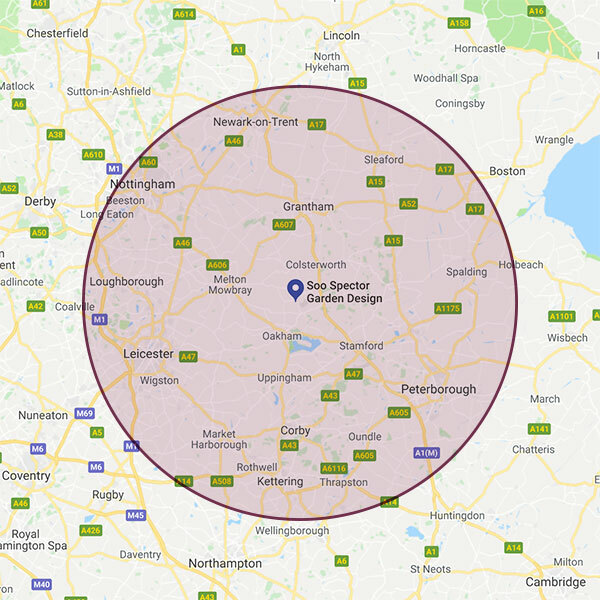 We provide garden design services to the Leicestershire & Rutland geographic area including Leicester, Melton Mowbray, Oakham, Loughborough, Stamford, and Peterborough. Just a few lines to thank you for my lovely garden, it looks amazing! I am so looking forward to seeing everything in bloom. Many thanks to your landscapers, they have done such a great job. Paul's patio is so good, and I can't stop constantly looking out. We engaged Soo to design our garden from scratch on the strength of her pitch to us, she was not recommended to us but we have been delighted with our new garden. She has been organized and professional throughout, she was keen to design a garden that fulfilled our brief but offered sensible, practical, realistic suggestions. For the tasks that she could not complete herself, she engaged reliable, professional contractors to do the job in a timely manner. There were various strands of the garden design that Soo sourced at acceptable cost to us and she liased with the suppliers to ensure that the whole garden came together. She is full of suggestions for places to purchase garden supplies reasonably locally. Soo brought a totally new perspective to our garden, gave us lots of ideas for planting and layout and came up with ideas that will make the most of our outdoor space without having to spend a huge amount of money. She really listened to what we wanted and understood what would suit us. She is passionate about gardens, plants and her clients and a pleasure to work with.